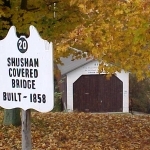 Shushan Bridge was originally constructed in 1858 by Milton & James C. Stevens, it is listed on the National Register of Historic Places as of March 8, 1978. The bridge is currently a museum (and a very interesting one, at that) open every day, except Monday, through the summer from 1 to 5 PM. 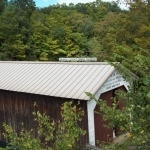 The bridge (museum) is located in the Town of Jackson-Salem, east of State Route 22 on County Route 61 in the village. It is over the Battenkill, a two span bridge of 160 feet of Town truss. 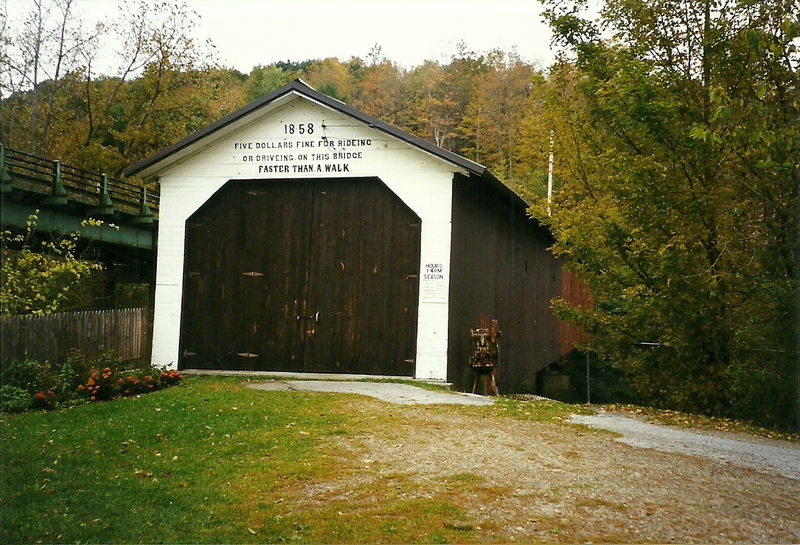 Built by brothers, Milton and James Stevens, during the spring and summer of 1858 (the same year as the Eagleville Covered Bridge), this 161-foot-long, two span structure incorporates the Town lattice truss design patented on January 28, 1820, and again in 1835 by Ithiel Town of New Haven, Connecticut. 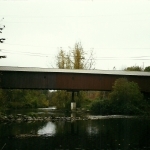 The bridge trusses were laid out and assembled on the village green beside the railroad depot, then drawn by oxen to the bridge site where they were erected over the river on a system of false work. When originally built, the bridge was supported near the middle by a large pier made of dry-laid stone. The pier, twenty feet square, rose from the still water of a mill pond formed by a dam a short distance downstream. When the dam washed out in the flood of 1927 the pier became an obstruction in the now fast-flowing stream. It was replaced by a narrower pier in 1938. 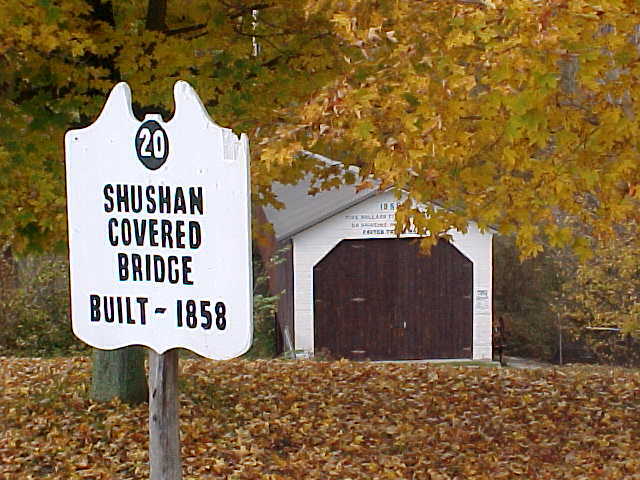 The Shushan Covered Bridge has 46 panels, each 3½ feet on centers. All truss timbers are white pine, spruce orhemlock fastened at the joints by treenails (pronounced “tunnels”) of either red oak or locust. The total weight of the bridge, including roof and siding, is estimated at80 tons. Although posted for a safe load of 5 tons, it has been estimated that it could have safely carried six times that amount. 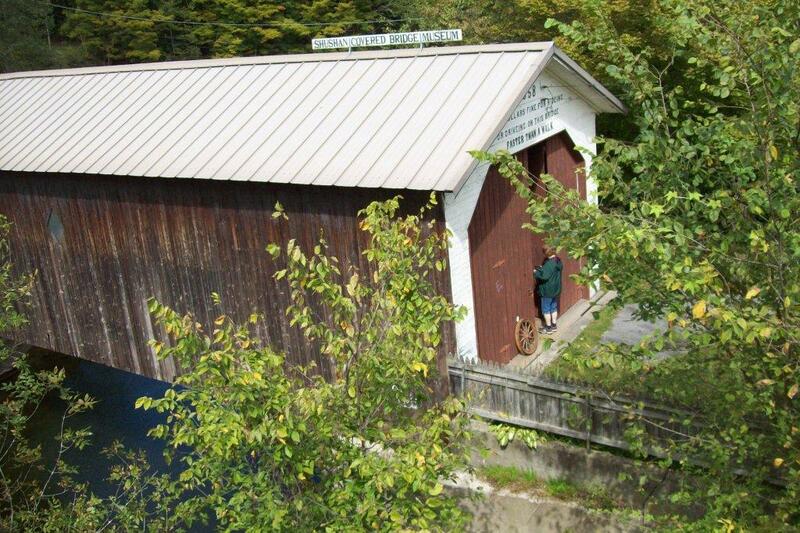 In 1962, a new steel bridge was built and the Shushan Covered Bridge was bypassed. 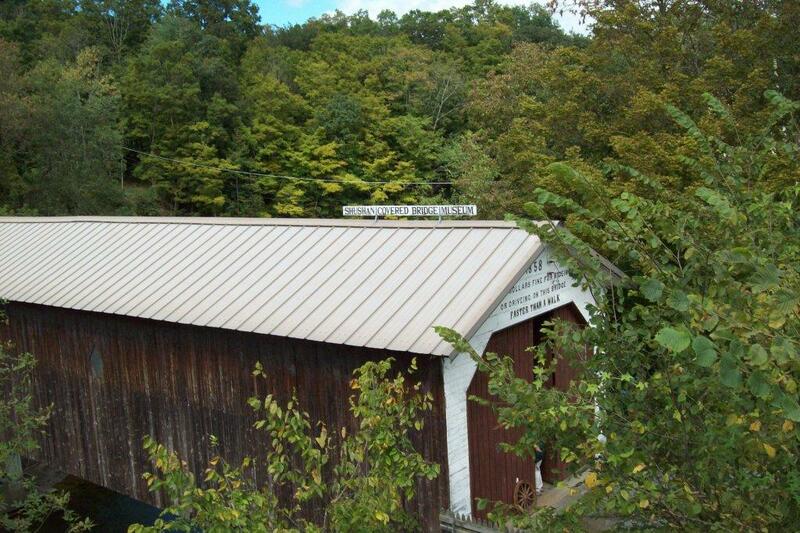 It stood for over a decade as the longest single span covered bridge on the Batten Kill. In order to build the new bridge, one end of the old bridge was swung out of the way onto a T-shaped pedestal and the mid-stream pier was eliminated. During that time, however, a leaking roof caused damage to the upper chords, leading to its near collapse in 1974. An alert crew of Shushan residents noticed the bridge visibly sagging and managed to prop it up temporarily with telephone poles. 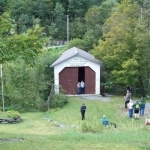 In May 1974, the Shushan Covered Bridge Association was founded by John Rich and Carleton Foster and grew to include most of the residents of Shushan. 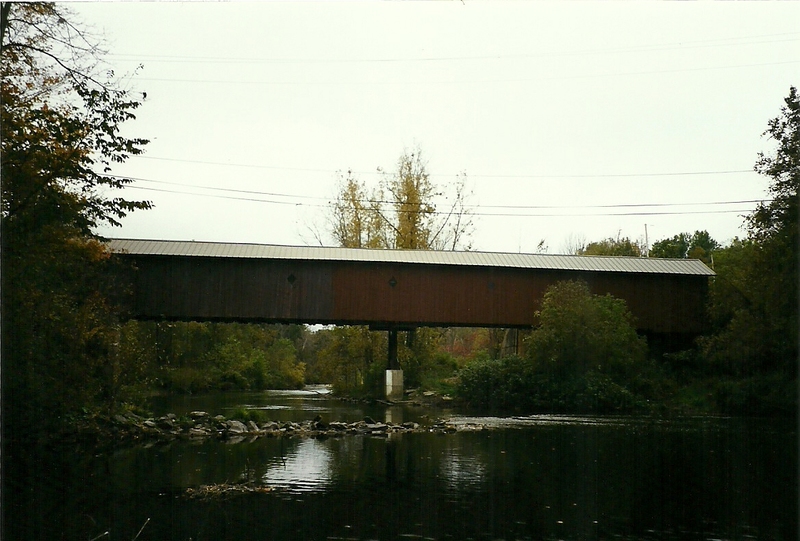 The all-volunteer group bought the bridge from Washington County for $1.00, erected a new center pier, and installed a new roof. 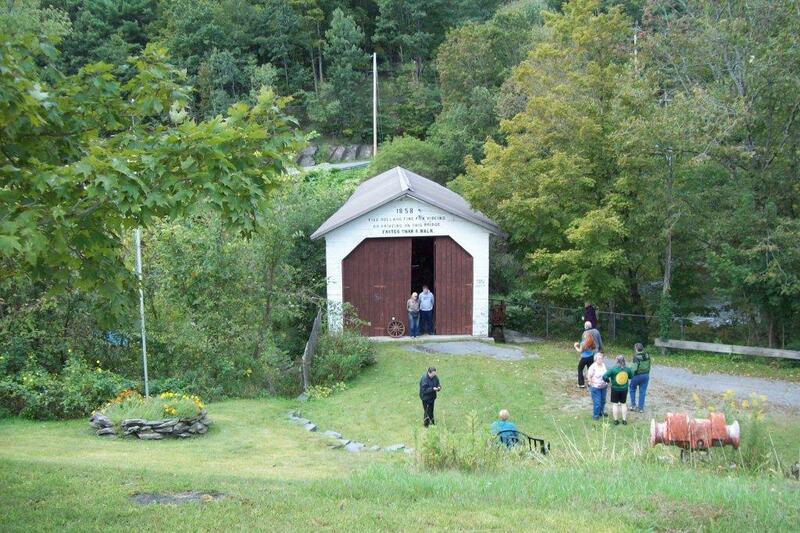 At a ceremony on August 13,1983, New York State Assemblyman Neil Kelleher presented a copy of a resolution passed by the New York State Legislature recognizing the 125th anniversary of the Shushan Covered Bridge. It now serves as a museum of farm tools, mostly donated by Shushan farmers. Volunteers continue to keep the bridge fit for the limited duty now imposed upon it. 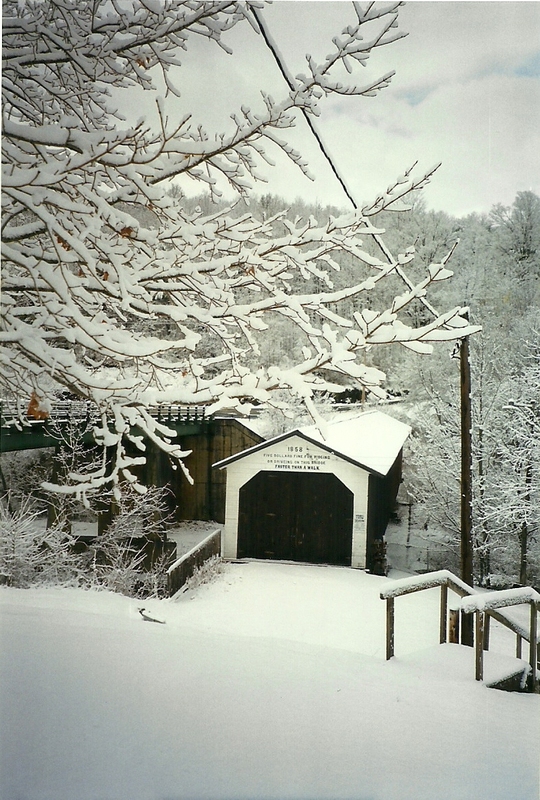 Excerpted from The Covered Bridges of Washington County, New York by Robert G. McIntosh. 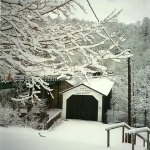 The bridge is in downtown Shushan on County Route 61.